Up until just a few years ago, there weren’t that many internet TV providers. But now, several big brands are offering internet TV services. If you’re stuck comparing Philo vs. Sling TV and don’t know which one to choose, keep reading to find out 8 important facts about how these services match up. Philo Vs. Sling TV: Which Is Better? Do you use a TV antenna to watch TV? Philo and Sling TV both fall into the “skinny bundle” category of internet TV providers. Instead of forcing you to buy channels you don’t need, skinny bundles let you buy small packs of channels. If you’re a fan of reality TV, how-to shows and “edu-tainment” programs that you might find on History Channel, Discovery, HGTV and other similar channels, Philo is worth a look. Philo’s ultra-cheap $16 subscription comes with 43 lifestyle and general entertainment channels. For $4 more, you can add twelve more special interest networks to your account, bringing the total to $20 for 55 channels. That’s quite a bargain. Philo’s extremely low prices are its main selling point. No other internet TV service is cheaper than Philo. Even though Philo is super inexpensive, it has all the next-gen TV features that competing internet TV services offer. With Philo, you can record as much TV as you want and access your recordings for up to 30 days, and you can also stream on 3 devices at once. Also, Philo learns what you like to watch and serves up show recommendations based on your viewing habits. Philo’s biggest weakness is its lack of channel variety. With Philo, all you get is reality TV, cooking shows, talk shows, documentary style programs and the like. American news channels, sports channels and the “big four” American broadcasters are not available. Another issue with Philo is that it is still in the process of churning out apps for several key platforms. Philo has rolled out apps for Amazon Fire and Apple TV (4th gen and later), but still doesn’t have a dedicated app for Android, despite having a functional iOS app for more than a year. Philo hasn’t revealed how many subscribers it has, probably because it just came out in November of 2017. Sling TV offers similar prices and more variety compared to Philo. When you subscribe to Sling TV, you have to choose from one of three different base plans: the $25 Orange plan, the $25 Blue plan or the $40 Orange + Blue combo plan. All the base plans can be customized with a variety of channel add-ons packs. Sling TV’s $25 Orange subscription is one of the most well-rounded deals for cord-cutters on the market. Sling Orange doesn’t have any of the “big four” broadcast networks, but it does have ESPN and some other popular cable channels. If you use a TV antenna to fill in the missing channels, you can cut the cord without missing a beat. Sling also shines when it comes to app support. Because Sling TV has been around longer than any other internet TV provider, it works with more next-gen TV devices than any other TV service of its kind. If you want next-gen TV features, you have to be willing to fork over more cash each month. Recording features cost an extra $5. And for some reason, you can’t record ESPN or any other Disney-owned channels. You can also only stream on 1 device at a time with Sling Orange, though that increases to 3 devices with Sling Blue. Sling TV has more than 2.2 million subscribers. That puts Sling TV ahead of any other internet TV service on the market. Both Sling TV and Philo offer low-cost, stripped down TV subscription deals. Philo’s cheapest subscription costs $16. Sling TV’s packages start at $25. Sling Orange recently jumped in price from $20 to $25, so Philo is now quite a bit cheaper. Philo’s channel menu is smaller and much more specialized compared to Sling TV. As mentioned above, Philo caters to fans of reality TV, talk shows and educational programming. There’s no way to get any sports, news or broadcast channels through Philo. 43 channels for $16 per month. 55 channels for $20 per month. Sling TV, on the other hand, has all kinds of different channels — including several networks that your local cable provider probably doesn’t carry. Once you get a base plan, you can add all kinds of different channel expansion packs. The price of the expansion packs changes depending on which base plan you have, but most of the Extras cost $5-$10. Sports Extra: Adds all kinds of extra sports channels, including beIN Sports, Motorsport TV, NBA TV, NHL Network and more. Kids Extra: Key channels in this pack include BabyTV, Boomerang, duckTV, NickToons, Sling Kids and TeenNick. News Extra: If you’re a news junkie, you can buy the News Extra and get all kinds of international and national news channels like BBC World News, CGTN, Euronews, France24, HLN, NDTV, News18, RT Network, TheBlaze, Weather Nation and others. Lifestyle Extra: Standard channels with this pack include Afro, BET, Cooking Channel, DIY, FYI, Hallmark Channel, Hallmark Movies & Mysteries, Lifetime Movie Network, VH1, Vibrant and Z Living HD. Sling TV’s recording features are in need of an upgrade. Philo lets you record TV content for free. You have to pay extra to unlock DVR recording on Sling TV, though. And even after you unlock recording, you still can’t record any of Sling TV’s Disney-owned channels. Philo also has better family features compared to Sling TV. With Philo, you can stream to as many as three devices at a time without any restrictions. These limitations are still in place if you get Sling Orange + Blue. You can still only watch Orange channels on 1 device at a time, and Blue channels on 3 devices. If a channel is shared between both packages, you can watch it on 4 devices at once, though. Sometime this year, Philo will release more next-gen TV features. Soon, you’ll be able to see where your friends and family are at in a TV series and find out whether or not they are watching TV. Whether or not Philo’s upcoming social features will succeed, however, remains to be seen. Netflix has flirted with social features, but discontinued them after they proved to be unpopular. Sling TV has a very strong selection of sports channels. Fox Regional Sports Networks, Fox Sports 1, Fox Sports 2. NBC Regional Sports Networks, NBC Sports Network. ESPN, ESPN2, ESPN3, ESPN Bases Loaded, ESPN Goal Line, ESPNews, ESPNU. beIN Sports, Motorsport TV, NBA TV, NHL Network, Outside Television, Pac-12 Network, Stadium, Univision Deportes. ACC Network Extra, SEC Network, SEC Network+, Golf Channel. As mentioned above, Philo doesn’t have any sports channels at all, with the exception of Velocity, which occasionally shows some motorsports programming. Philo has been working hard to change this, but it’s still true. Even with the addition of an Apple TV app and Amazon Fire TV app, Sling TV still comes out on top. This is perhaps no surprise, given that Sling has been around — and developing apps — for more than 3 years, while Philo has barely been out for even a year. Here’s an overview of the different apps available with each service. Mobile devices and tablets: iOS. Android is supported only through the Chrome mobile browser, there is no dedicated app. One nice thing about internet TV is that none of the internet TV providers lock you in with contracts. If you’re waiting for a Philo app to come out, you can just subscribe to Sling TV or some other internet TV service and then switch over when Philo rolls out whatever app you need. Many cable channels let you access live streams and full episodes via their apps, but only if you subscribe to a TV service that’s compatible with TV Everywhere. Both Philo and Sling TV are compatible with TV Everywhere. It used to be that Sling unlocked more apps, but Philo is now the champion. You can use TV Everywhere to access just about every channel in both the 55 and 43 channel packages. In contrast, Sling TV only works with 22 apps. It’s not hard to pick a winner, here. On-demand videos let you tune in and watch your favorite shows and movies whenever you want. Currently, Netflix and Hulu are the biggest on-demand players. However, Sling TV’s on-demand library is pretty big as well. Sling TV says it has 10,000 hours of on-demand content. Philo’s relatively small on-demand library could be a deal breaker if you don’t already subscribe to an on-demand service. According to Philo’s website, Philo stores around 1,000 hours of TV show videos in its on-demand library. Philo doesn’t have any movies, though, but this may not be much of a concern if you already subscribe to a service like Netflix, Hulu, or Amazon Prime Video. If you still can’t decide between Sling TV and Philo, try them both out yourself for free. Both internet TV services have 7-day trials. One convenient thing about Philo’s trial is that you don’t need to pull out your credit card to sign up for it. All you need is a mobile phone number to unlock 2 days of free TV — you’ll have to give them your card to unlock the following 5 days of the free trial. Right now, Sling TV has more to offer compared to Philo. However, that may change as Philo matures and as Philo releases more apps. On the other hand, Philo may be the better choice depending on how and why you watch TV. 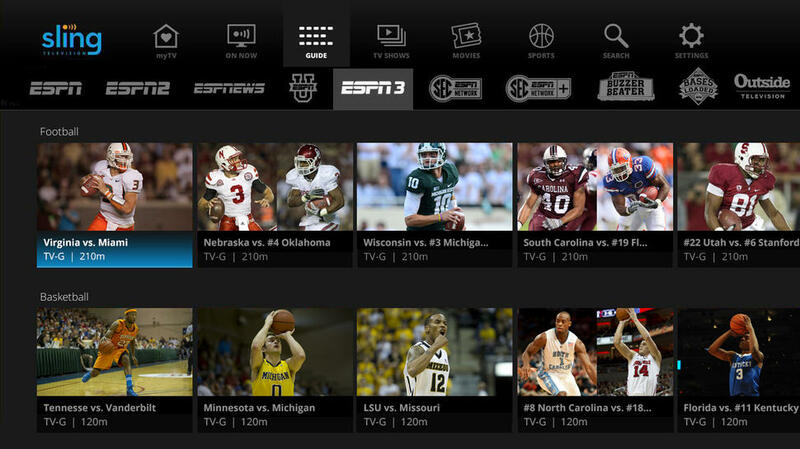 If you can’t live without sports, Sling TV is the obvious better choice. Philo doesn’t have any sports channels and it also doesn’t have any of the “big four” American broadcast networks. Conversely, if you don’t watch sports at all, it could make more sense to go with Philo. Sling has placed a “one stream at a time” limit on all Sling TV Orange channels, which is a significant downside — especially if you intend to share your account with your family. Philo lets you stream all of its channels to up to three devices at once, plus it will roll out new social features this year. Additionally, Philo has better recording features compared to Sling TV. Sling TV’s Orange base plan and Philo both help fill in the gaps that you’ll encounter once you cut the cord and start using your TV antenna to get your entertainment. However, Sling Orange offers a more well-rounded selection of networks. Philo has a strong mix of lifestyle channels, but it lacks news and sports.